Taylor completely stole the runway at the GCDS and Phillip Plein shows. Teyana Taylor turned heads with her dance routine in the video for Kanye West's "Fade" last year, and the artist isn't giving anyone the opportunity to forget that she's one of the best performers out there. Taylor took the runway at Italian streetwear brand GCDS's show on Friday, and Phillip Plein's show the following night. During both events, Taylor completely stole the show with her runway performances. "When I watched the video I was like, 'Damn, I'm so extra," Taylor told USA Today of her first appearance for GCDS. "But then I realized I'm not extra, I'm spicy, that's all. I'm just spicy, I put a little spice in everybody's life." During the Phillip Plein show, Taylor busted out a choreographed routine to Future's "Mask Off." 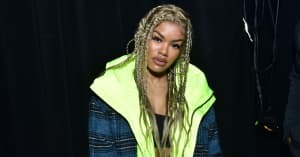 Watch the highlights from Teyana Taylor's NYFW appearances below.